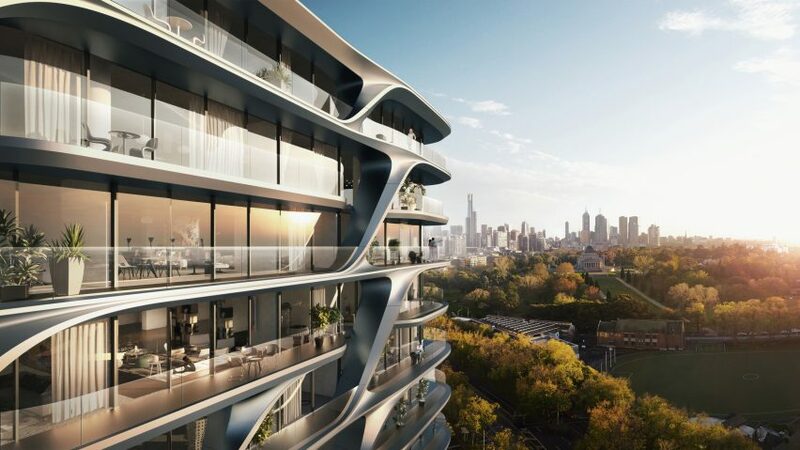 Zaha Hadid Architects has unveiled its designs for a 64-metre apartment block in Melbourne, which will feature facades covered in angular balconies and a roof topped by a pair of swimming pools. The 19-storey tower named The Mayfair will be located on St Kilda Road, which links the district of St Kilda with the central business district – where the firm is working on another tower featuring filigreed facades. Zaha Hadid Architects is collaborating with local architect Elenberg Fraser on the project, which is expected to cost AUD$330 million (£194 million) to complete. The tower will house 158 residences as well a communal roof terrace with two swimming pools overlooking a nearby lake. At street level there will a cafe and restaurant. Glazed balconies will also allow residents to benefit from expansive views from their apartments, which will have between one and five bedrooms and range in scale from 70 square metres to 556 square metres. Balconies are separated by diagonal struts that link with the floor plates below to create a continuous design around the facade. "Taking its cues from the fluidity within Australia's landscapes and seascapes, the facade's composition has evolved from a system of simple wave formations that is further developed to generate variables of the same design language," said the studio in a statement. "The fluid forms of the facade define large balconies for each apartment and spectacular views of the Royal Botanic Gardens, Port Phillip Bay, Albert Park and skyline of the Central Business District." The curvilinear design of the balconies is typical of the practice's style, and it recently unveiled plans for another residential complex on Mexico's Riviera Maya featuring balconies with a similar design. The parametric design allowed the firm to reduce the number of different facade panels needed for the tower, in turn lowering its cost. "Building on ZHA's expertise in delivering complex architectural geometries, computational parametric design allowed an optimising algorithm to identify shape similarities within the facade to a tolerable degree, minimising the number of different facade panels required," explained the firm. "Using algorithms to determine these variables enables the facade to adapt to the wide variety of different apartment layouts and also adapt to the irregular site," it added. "This process enabled the creation of the building's sculpted facade that would have otherwise been cost prohibitive." These forms are continued through the interiors, as a graphic behind the reception desk and in the design of custom furniture. Zaha Hadid Architects lost its founder, the British-Iraqi architect Zaha Hadid in March last year. The London-based firm is now led Hadid's former partner Patrik Schumacher. It is currently working on a Beijing skyscraper featuring what promises to be the world's tallest atrium, and a masterplan that will transform Tallinn's port area.